Attractive map showing Indian tribes in Mississippi. An attractive 1833 first edition example of the Society for the Diffusion of Useful Knowledge or S.D.U.K. map of Arkansas, Missouri, Mississippi, Kentucky, Tennessee, Alabama and Illinois. The map covers from St. Clair in Missouri to Hempstead in Arkansas and east as far as Breckinridge in Kentucky and Shelby in Alabama. Towns, rivers, mountains, Indian villages and topographical features are noted throughout, with relief shown by hachure. Identifies Little Rock, Hot Springs and Batesville among other important landmarks. This map is part of A Series of Maps, Modern and Ancient, issued by subscription. Each folder in the series would contain a set of two maps bound together. 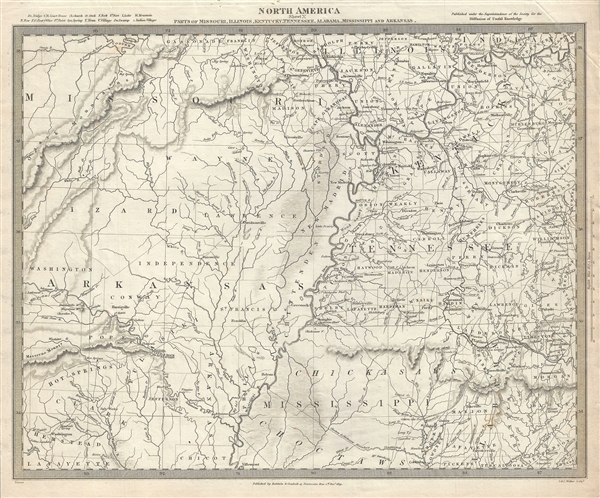 The map accompanying this folder, not included here, was of the western part of India. Original folder includes the names of committee members of the ‘Society’, contents of numbers previously published, the folder number, which is this case is XLI, the contents and the printer and publication details. This map was printed by William Clowes and issued by the Society for the Diffusion of Useful Knowledge in their Dec 1, 1833 subscriber’s edition folder. The folder at the time was priced at 1 shilling plain or 1 shilling 6 pence colored. Published by Baldwin and Cradock. Baldwin and Cradock (fl. c. 1810 - 1860) were London based publishers working in the early to mid 19th century. They are best known for their publication of the Society for the Diffusion of Useful Knowledge's ground breaking subscription atlas. They also published John Thomson's magnificent New General Atlas from 1814 - c. 1820. In addition to their cartographic corpus, the firm had wide ranging publishing interests in many other areas, including books, broadsides, and an investment in Blackwoods Magazine. They had their offices at 47 Paternoster Row, London, England. This firm also published under the imprint Baldwin, Cradock, and Joy and Cradock and Joy. A Series of Maps, Modern and Ancient, Dec 1, 1840. The Society for the Diffusion of Useful Knowledge (S.D.U.K.) Atlas was initially issued in parts over several years by Baldwin and Craddock to promote the society's mission of egalitarian self-education. The first S.D.U.K. began appearing in 1829 when the society contracted John Walker to produce the first proofs. The first S.D.U.K maps were produced serially by Baldwin and Craddock and issued in 2 map batches, priced at 2 shillings each. The series, originally anticipated to feature 50 maps, ultimately contained 200 and took over 14 years to produce. The initial production was completed in 1844 when the whole was issued in its first compiled atlas edition. Around 1842, following the 1837 bankruptcy of Baldwin and Craddock, publication of the atlas was taken over by the Society itself, who issued editions in 1838, 1839, 1840, 1841, and 1842. Overburdened by the work of publishing, they then outsourced the publication to Chapman and Hall in 1842. Chapman and Hall produced editions in 1842, 1843, and 1844. Dissatisfied with the quality of Chapman and Hall printing, the Society turned to another publisher, Charles Knight, who issued editions under the auspices of the Society in 1844, 1845, and 1846. In 1846 Knight officially acquired the plates in his own right and reissued in revised editions until 1852, when he sold them to George Cox. Cox in turn sold them to Edward Stanford who published them from 1856 well into the 1860s. The S.D.U.K. Atlas is known for the quantity and quality of its maps. The S.D.U.K. published many maps of areas largely ignored by other publishers. The many city plans incorporated into the atlas are particularly admired and are the highlight of the S.D.U.K. 's long map publishing history. As a whole the S.D.U.K. Atlas was groundbreaking in terms of quality, scope, and being offer at a cost effective price point. Very good. Mior spotting. Minor crease near top right quadrant. Accompanied by original subscription folder.